Each year during Black History Month, the Black Law Students Association at Samford University’s Cumberland School of Law hosts a symposium with the purpose of providing students, attorneys and the public critical information about legal issues affecting minorities. 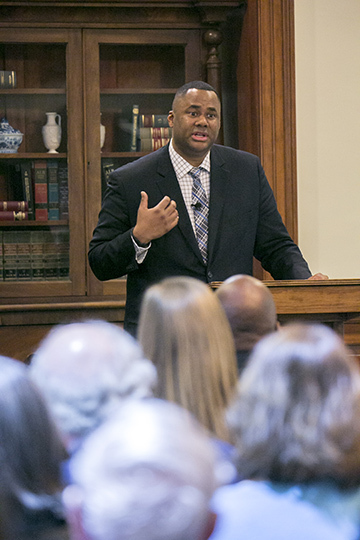 This year’s symposium, “From Selma to Shelby: The Fight for Voting Rights,” was held March 4 with Ryan Haygood, president and chief executive officer of the New Jersey Institute for Social Justice. Haygood spoke on the ramifications of the 2013 Shelby County v. Holder U.S. Supreme Court decision and recounted several specific instances where the pre-clearance provision of the Voting Rights Act had recently prevented voter disenfranchisement. There were several questions from the audience, including local judicial candidates. Haygood closed with an example of the state of Texas’ actions following Shelby County v. Holder, where Texas used strict voter ID laws to prevent voter fraud, despite the fact that there had been no evidence that in-person voter fraud had occurred. Haygood has been engaged in social justice advocacy on a national level for more than a decade. Former deputy director of litigation at the NAACP Legal Defense and Education Fund Inc., he has been heavily involved in some of the most important civil rights and social justice issues, including twice defending the constitutionality of a core provision of the federal Voting Rights Act before the U.S. Supreme Court. Through the institute, Haygood works to advance its mission of identifying, analyzing and addressing the underlying causes of social and economic disparities and to challenge the barriers that constrain cities and their residents from achieving their full potential. This year marked the 22nd year of the Thurgood Marshall Symposium’s existence.